For my recent birthday, my mom gave me this needlepoint pillow from Salvation Army. I don't think I've ever received such a nice $2 present! Gorgeous! I love needlepoint no matter where it was purchased, so I would definitely not take offense to its being secondhand and since she's your mom, she was obviously comfortable sharing its origins. How was the rest of your special day? What a beautiful gift. What impresses me too is your mother is being frugal too! You must have received some good frugal advice from her. And I don't think I've ever SEEN such a nice $2.00 present! It really is beautiful. I love it, I too would have bought it, had I found it. Just love Thrift shop deals. It looks right at home in your arm chair. That cushion is so pretty. What a lovely gift to receive. Love the pillow! 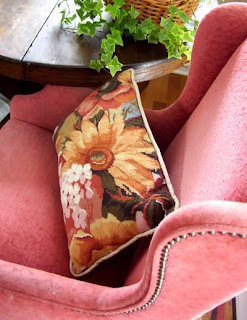 Any type of needlepoint is cozy, don't you think?! Would've been good to rest against today sipping tea. We had a very Londonish day today...the air so heavy with moisture. *sigh* I never have that kind of luck at the SA. I need to come thrift in Nasvhille. Planning to bring DS down to the science museum soon, so perhaps then. I've seen pillows like that retailing for 11 dollars or more. I'd much rather pay 2 dollars, and I'd rather my mother did too. I come from a background where you share the information on getting a great bargain. Some people hide the fact that their great things are second hand, but I don't! I share the news and joy. I love getting a good deal. That is very pretty, need to hit up the goodwill more often.